In the movie, Stripes, Bill Murray says, I rarely wear underwear and when I do it is usually something unusual. Well, I’m hear to tell you that just the opposite is true with me. I always wear underwear and it is never something unusual. I’ve tried jockey shorts (they’re too tight), boxer shorts (they’re too loose) and gimmicky gift underwear (they’re too goofy). To me, the best men’s underwear is the traditional, usual, white briefs. Now, that we’ve narrowed it down to best type of men’s underwear, what is the best brand. Before we delve into that, I’ve begun to notice a few quality problems with men’s underwear in general. They lose their elasticity and won’t stay on. They have a tag or stitching that scratches your waist or tailbone. They lose their shape and fit. The inside flap or crease no longer stays closed. Honestly, I’ve bought underwear that starts falling apart after only the 3rd or 4th time it is washed. Some men’s underwear seems prone to lose its elasticity. While I’ve been known to pack a small ice pack between my back and the elastic, it really is no excuse for it to fall apart so easily. Other underwear seem to hold up fine. It is really annoying when underwear no longer keeps the same shape and fits like it did when it was new and what’s up with all the holes? That’s just plain cheap material. Probably the worst thing at all is when that inside crease no longer stays folded together. Might as well act like Bill Murray and where no underwear at all. With that said, here are the rankings for best mens underwear. Fruit of the Loom underwear is aptly named. They might as well be made from banana peels. They hold up worse than any other brand of underwear I’ve tried in the last 20 years. It seems as though they were good at one time, but perhaps they started manufacturing them elsewhere (like in China?) to save costs. The Fruit of the Loom brand are notorious for losing their elasticity. Haynes holds together much better, but the material seems thin and cheap and they develop holes over-time. Good products often prompt me to write articles in order to recommend them. I was so happy with the Kirkland white mens mid-rise underwear from Costco that I had to say something good about them. They are head and shoulders better around your waist than any other pair of mens underwear. I’m one happy Dad. Why? Well, for one thing I got this new pair of summer shoes for Fathers day; pictured left inside the very handsome muscular, foot. I believe they are known as Speedo Water Shoes. To me, the Speedo brand name means “really tight, feminine-looking swim suits for men.” Just the mentioning of the name, Speedo, literally makes me gag. I don’t like tight clothes and have no desire to see other men in them either. So, Speedo shoes? Really? Thankfully, the genaralization I have of other Speedo-Brand men’s clothing doesn’t transfer over to their shoes. Thfey look innocent and inconspicuous enough that a small child could wear them without drawing attention to himself. In fact I’ll go out on a limb here and say that even a John Wayne – tough-kind-of-guy could walk into a western saloon wearing these speedo water shoes for men without apologizing to his masculine cohorts. In fact, these particular Speedo shoes actually look cool with their black color and sleek, curvy design. In fact, they are downright sporty. They look like somewhat similar to the Nevados shoes brand that I’ve been wearing for the last 5 years. I think my wife must have thought the Nevados shoes must have worn out or she might might not have even decided to buy me the Speedo pair for Fathers Day. Or maybe she just thought I could use a stylish, second pair in the cool-looking black color. As you can see by the picture, the Nevados shoes held up rather well -and I’m really tough on shoes – any type of shoes! 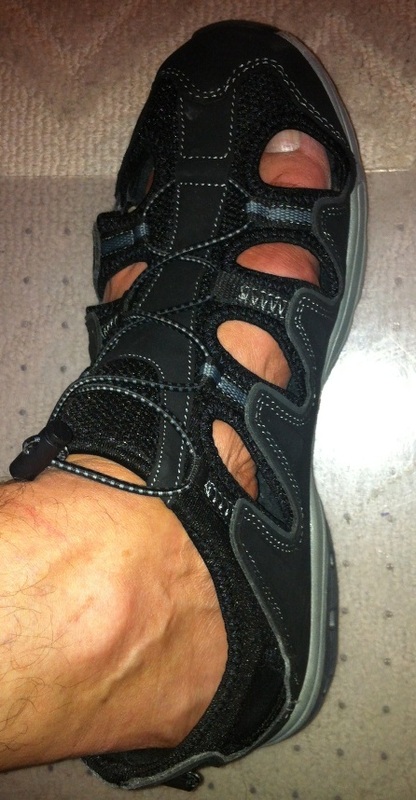 I really love the grip of these Teva-Style, imposter shoes and the comfort. 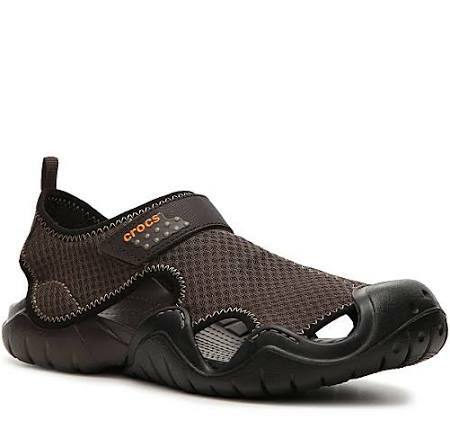 You can wear them around the house; at the pool; beach and even do some light hiking up mountain rocks in these types of shoes. Weather you’re washing your car; working in the garden or spraying down your kids or dog with the hose, you can comfortably wear these shoes without worrying about getting wet. In fact, you’re supposed to get wet in these shoes! The surface on the sole of either the Nevados or Speedos are very good on wet, slick surfaces and there is enough cushion and grip that you won’t hurt your skeletal muscles walking around in them all day. I am notorious for lower-back problems when walking or standing on my feet all day and a good pair of shoes make a huge difference. Now, I won’t tell you that these Nevados and Speedos give the same back and body support as a good pair of walking or jogging shoes, but they are very respectable. How do the Nevados and Speedos stack up against Teva? How in the heck should I know? What I do know is that the Tevas cost 5x the amount of money. There are other things to waste my money on, so I’m not about to find out with my hard-earned cash whether or not its worth it to see how well Teva does against a shoe that has already lasted me 5 years. I can’t say for sure if I’ll enjoy the same longevity from the Speedos shoes for men as I did the Nevados, but based on the look, fit and feel, they’ll do every bit as good. You can find these shoes for under $35.00 in just about any clothing store; your local department store, costco or online below. Give Men’s Speedos shoes a try this summer!